To kick off the New Year in style we are partnering with ‘Aisle Hire It‘ to bring BB readers a very special giveaway! Not one but TWO lucky readers will win their own giant illuminated letters – The first will receive the iconic ‘LOVE’ lights and ‘Love arch’, whilst the second will win their own giant initials and ampersand e.g. E & A, which will be tailored and guaranteed to add a unique touch along with two 6ft Blossom Trees. Aisle Hire It! 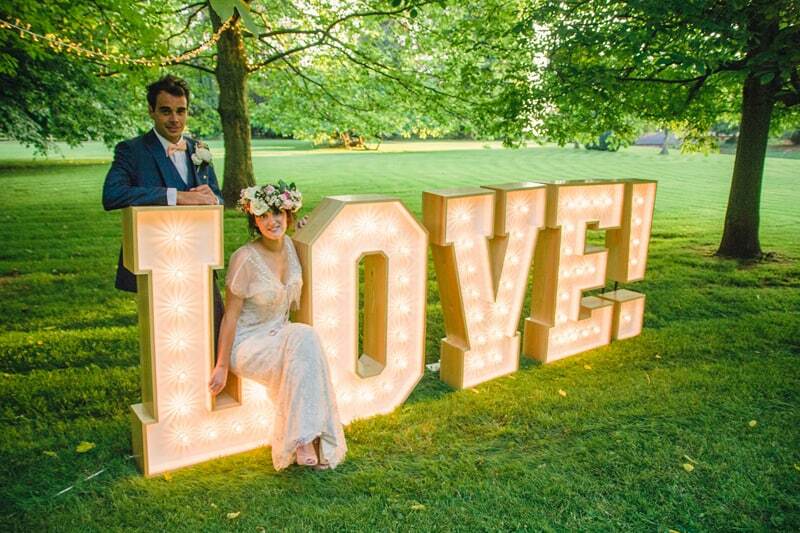 is only 6 months old but is already home to an EPIC collection of giant illuminated letters, LOVE lights, giant retro love hearts, quirky & cool props, and different styling pieces to inject some fun and luxe into any wedding. Owners & stylists, Ellis, Marcus & Jo Walby are not only a close family team, but also have a strong background in professional event organisation, fine art, carpentry, construction & mechanics, and bespoke design between them. If you’re looking for regular decoration items, such as chair covers – you’ve come to the wrong place. With giant illuminated 4.6ft alphabet, and 6ft luxe blossom trees, to a beautifully hand painted retro fairground game collection that’s launching next month, they really can help transform any wedding or event in an eccentric but elegant Aisle Hire It way! 2) Then send them an email to hello@aislehireit.co.uk with your full names, date of wedding and chosen wedding venue. 3) You can also double your chances of winning or enter twice by sharing the ‘WIN’ competition image that is posted & pinned at the top of their Facebook page. Be sure to check back on February 1st at 9pm on their Facebook page, where they will be announcing their winners! ♥ Open to both current and new AHI clients. If you win and have already booked hire items with us, we’ll either add the items, or refund you if you have already booked to hire them as appropriate. ♥ Included in the prizes are FREE delivery up to a 25 mile radius, FREE professional installation and FREE collection. If your wedding venue is beyond this radius 26+ miles away from our base in Ross on Wye, you must be prepared to pay delivery fees at just 50p per extra mile. ♥ Please do not enter if you are more than 50 miles away from our base in Ross on Wye. ♥ If you wish to state which prize you would prefer, please do so in your email to us with your date of wedding, venue address and full names. We cannot guarantee you these prizes should you win, but will do our best. ♥ We reserve the right to exchange items in the event of any damages prior to the function date, or as a result of unforeseen circumstances. ♥ Please ensure you are happy for us to use images from your wedding for marketing purposes. ♥ You are hiring the stated items, there will be no alternative and you cannot transfer the hire price to other item(s). ♥ Offer open to engaged couples, who are aged 18+. ♥ All details given will be used professionally in accordance with Data Protection Act 1998. ♥ Our normal Aisle Hire It Terms & Conditions apply minus the deposit and pending balance terms. ♥ This promotion is in no way sponsored, endorsed or administered by, or associated with, Facebook. You understand that you are providing your information to Aisle Hire It and not to Facebook. ♥ By entering this competition you automatically agree to the above terms and conditions, and agree to be bound to using Aisle Hire It as your letter light company and no other competitor. Oooh what a fun prize! Love it!